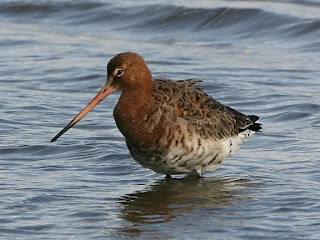 A quick look at the excellent http://www.deeestuary.co.uk/ late afternoon tells me that there are 20-odd Black-tailed Godwits at Gilroy Nature Park. Right, I'm cycling home as per usual so I'll just keep pedalling past our house and go straight there. As I get to our road I am so hungry I could eat a scabby donkey and swing home for a bite to eat. Well, you can't birdwatch on an empty stomach. My good chum MoorePatcher knows all about the importance of munchies. As I eat a ham & cheese butty I glance at the tide table. High water is 19.22 tonight, so if I time my visit to Gilroy for then a few extra waders may choose to see out the tide there. No rush. I'll have an apple as well then! I arrive at Gilroy and head down to the flooded field for a look. On the way I encounter some local "youth". I've got a lot of expensive optical kit about my person and I'm feeling slightly nervous as they size me up. Thankfully they seem more interested in their mobile phones than my scope and I can get on with a scan of the field. A nice big Grey Heron is stalking the far bank. The bank is littered with feathers moulted by the Mallards and Teals that are feeding here. About 30 Canada Geese are floating leisurely on the water with some juv Herring Gulls and some Black-headed Gulls. No sign of a Med Gull. 2 Pied Wags flutter by and are joined in the air by several House Martins and plenty of Swallows. A Moorhen is feeding 2 young on the back edge. On a fence post sits a fat Wood Pigeon, 7 posts down is a Carrion Crow. Now to concentrate on the waders. There are definitely fewer Blackwits. I count 15. My assumption about the tide bringing in more seems to be wide of the mark.... Still they look fine in their summer plumage, some a deep orangey-reddy-pink. I wait and watch the Blackwits until I've checked all of their legs for colour rings. This takes a while as several are wading belly deep in the water. There are no colour rings tonight. Ho hum. As I concentrate on the Blackwits I hear a loud "choo-choo" overhead. There it goes again. Greenshank. Where is it? I catch it as it circles the flood before it settles at the waters edge. I move up to another break in the hedge and set up the scope for great views of it. Would have got good pictures of this had I packed the camera. Fool! I hang around for a while hoping something else drops in, a Common or Green Sand perhaps. After a while a glance at my watch says it's time to head home. The Mighty Reds are in action tonight and I fancy watching it. Scope stowed I hurtle homewards in time to watch a 2-0 victory, all in all a rather pleasing evening.